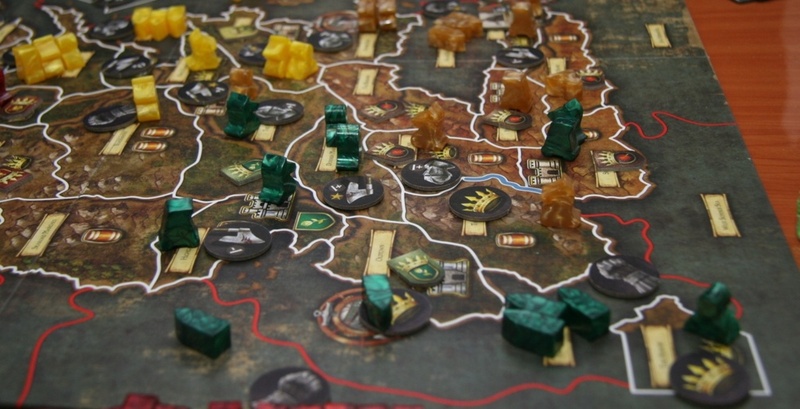 City of Horror, The Resistance, Twilight Imperium, A Game of Thrones: The Board Game, Rex: Final Days of an Empire, Hey That's My Fish! Pip: Shut Up and Sit down – despite the confrontational name – is almost always a hive of lovely cardboardy activity. That’s why I started playing games with them and that’s why I’m working with them now. But sometimes in gaming there are acts of betrayal, of contrarian buttheadedness, so large they cannot be forgotten. 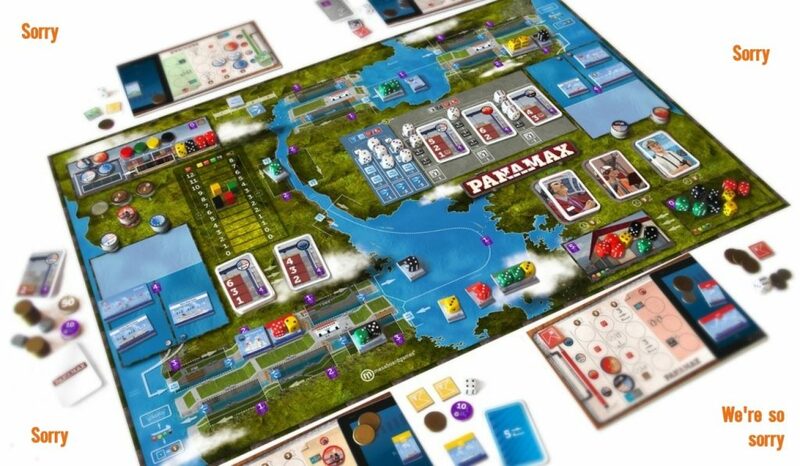 Instead they lurk in your mental back pocket, ready to be drawn out at a moments notice – reminders that these glorious friends and colleague care as much about boardgames as you do and will do almost anything for a few victory points. Or a cheap laugh. I’m not talking about the lower level stuff here. 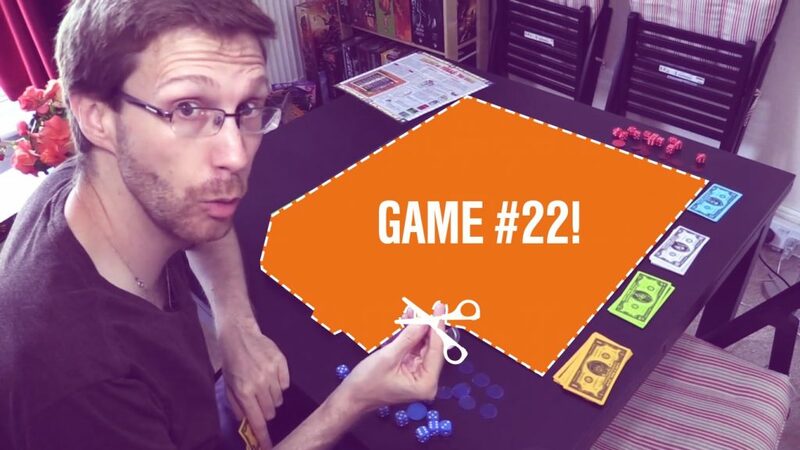 This isn’t about how Quinns will fail to tell you a rule until partway through the game (“Oh! Did I tell you about [rule which suddenly advantages what Quinns has been doing and nullifies any and all Pip-strats]?”). No. This is about Brendan and this is about City of Horror. Brendan, Quinns, our friend Phill and I were gathered for a game of surviving zombies. I’d done pretty well, I thought, and we were nearing the final stages of the game. Then suddenly everyone was heading for a particular building – not enough spaces for all of us! It came down to a vote. So much negotiating and so much discussion of who would or should use any remaining powers. I don’t remember the specifics, I just remember Brendan promising to help, to vote me in, to keep me safe. He voted to save Phill. I’d only just started being friends with Shut Up & Sit Down. I thought Brendan was a nice guy! I thought he was my friend. 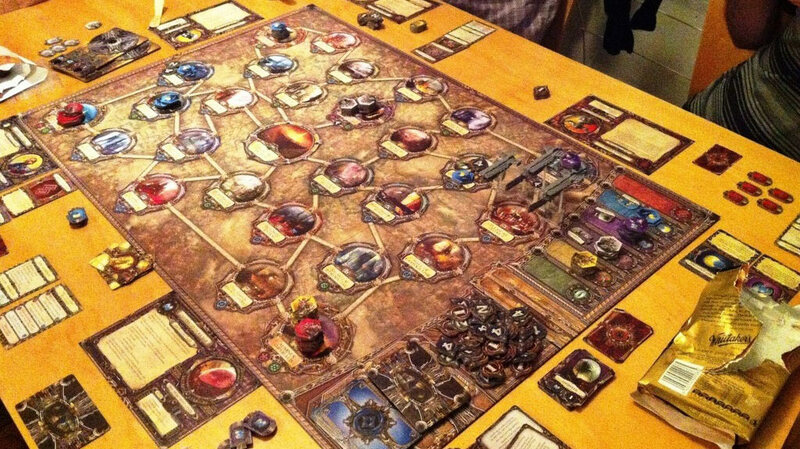 I’d also never really played board games like this before. 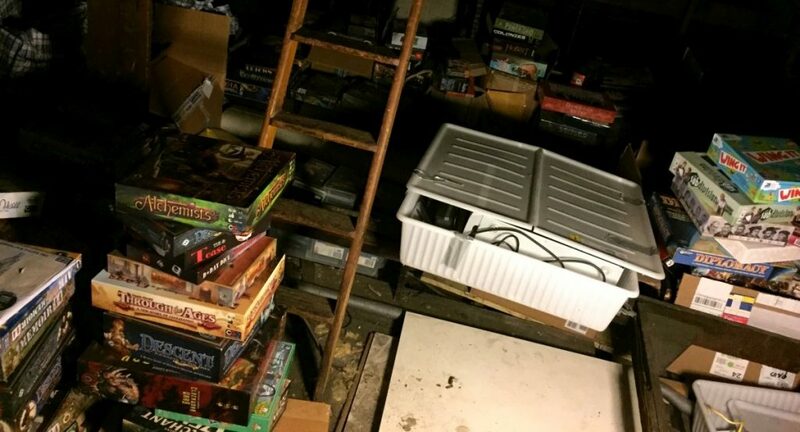 My parents both hate the things so board games weren’t a presence at our house. I didn’t know you could betray people. The SU&SD hive of loveliness now contained a mean bee with a big stinger. Brendan had decided he wasn’t going to win, I think, so was just seeing what happened if he played his own game and threw me to the shuffling horde. But that sting has stayed with me. Sometimes it’s a good thing because I don’t trust any of this lot as far as I can throw them when we’re playing a game. That, in turn, means sometimes I win! But the flip side is that every single time Brendan and I try to make an alliance I remember that moment and I back out or I start scheming against him. The moment he pushed me into the putrid arms of the undead and laughed. Brendan: I want the record to state that I do not remember any of this. I can neither confirm nor deny my tendency to betray close friends during boardgames. Oh no, wait, yes I can. I can totally confirm it. It started when my cousin went into courtship mode. A girl who worked in the local bar had staked her claim to him and when she visited us one night she brought friends with her to play games. So I did what any right-thinking human would do. I broke out the Resistance. Three attempts at the “spies-open-your-eyes” phase ended in some very telling fits of laughter. Finally we got through it without giving anything away. The spies? Myself and a girl called Sophie. Now, you should know this about Sophie: she is an actor. But I didn’t know just how effective an actor she was until she was my co-conspirator in that game. Over the course of the game, she perfected the tried-and-tested method of spying in the Resistance known as the “Pretending To Be Dumb” technique. She asked questions all the time, looked confused, even bored. She faded into the background like an octopus. It came time for a mission. The only participants were my cousin and I. We flipped the cards and there it was: mission failed. This was it, my favourite part. Lying time. The more I spun my chronicle of untruth the more flustered my cousin became. He began to stumble over his words, accuse other people, argue against me incoherently. I laughed off his words and waved his arguments away with a dismissive shrug, eventually ignoring him and speaking only directly to the others. He was the spy, it was clear. Couldn’t they see that? “I don’t know who to believe anymore,” said Sophie, with a sad look on her face. What an expert. When the final mission went ahead, we had it in the bag. My cousin watched with disgust as my smile broadened to greet the cards as they came up. mission failed. “I TOLD YOU,” he roared. He began to roll a cigarette with furious, shaking hands. Before he went off to smoke himself calm, he looked at me, holding back an embarrassed anger I have not seen since we were teenagers. “I am never playing this with you again,” he said. Paul: I have so many stories of betrayal. So many. I’ve been betrayed in One Night Werewolf, in Game of Thrones, even in Dobble (if you didn’t think you could be betrayed in Dobble, you’re not playing with our friend circle). I’m pretty sure Matt is behind most or all of them, even if he wasn’t playing, and if you’ve not seen our playthrough of The Resistance then you must watch it just to see how devious he can be. But I want to talk to you about Twilight Imperium and I want to tell you two different stories about it, two different librettos for this space opera. The first is about The Ghosts of Creuss. It’s about being The Ghosts of Creuss. The Ghosts of Creuss are a mysterious race: secretive, ethereal, inscrutable. When I took control of them for a day’s gaming a few years back, I decided that I would play them in character. They had to be a little cold, a little stand-offish, even a little inflexible. They were aliens, after all, and they had their own standards of honour. Now, a person who doesn’t really have any standards when it comes to honour is Quintin Smith. I don’t know if you know what Quintin Smith is like when he’s in space, but let me tell you. Quintin Smith is rather like this. You’ll read a lot of stories here about people being betrayed and how disappointed they are when this happens. Mine is a story about how you should respond to betrayal when, say, it comes from Quintin Smith. You should respond to betrayal with maximum force and refuse to give an inch of ground. You should deploy all your resources to come down hard on those who have transgressed and never compromise. You should chase down their fleet and watch their admiral flee, feeling free to step into their territory as if it’s your own. Take their toys away from them and, if you can’t take them, break them. You should also do this at the expense of whatever other plans you had, completely taking your eye off the broader strategic situation. Possibly. Maybe. Whatever. What you should definitely do is Teach A Lesson. Quinns: You’re kidding. I also wanted to tell the tale of The Ghosts of Creuss vs. my Asteroid Moles, but I remember it very differently. I don’t know what you were playing, Paul, but I was playing a board game about war. One with tiny plastic cruisers and something called a WAR SUN. Were you expecting that we’d all just slowly fill the board with ships and nothing more, turning the board into some kind of interstellar car park? Quinns: The betrayal I want to talk about wasn’t anything as hum-drum as my friends lying to my face. It was Paul’s cast-iron overreaction when my space moles may have rearranged our borders a bit. He was angrier than he had any right to be, and proceeded to spend almost the entire game belching warships out of his ghostly wormhole home, dragging me into a war of attrition that meant neither of us would win the game. I remember Paul finally relented not after any tactical coup, but when he felt my spirit had been utterly crushed. But it was too late. It’s telling that I can’t even remember who we played that game with, or who won. But I remember exactly where Paul was sitting, exactly where I was sitting, and every turn of our horrible, pointless war. Paul calls it “roleplaying”. I think that might not be the whole picture. You see, English people tend to keep their feelings hidden. I think Paul found an outlet for his anger. It just happened that this outlet was pretending to be a species of ghosts from another dimension. I’m not saying that’s unhealthy. I wouldn’t dare. I’m just saying: Think about it. Paul: My second story is the story of Rob. 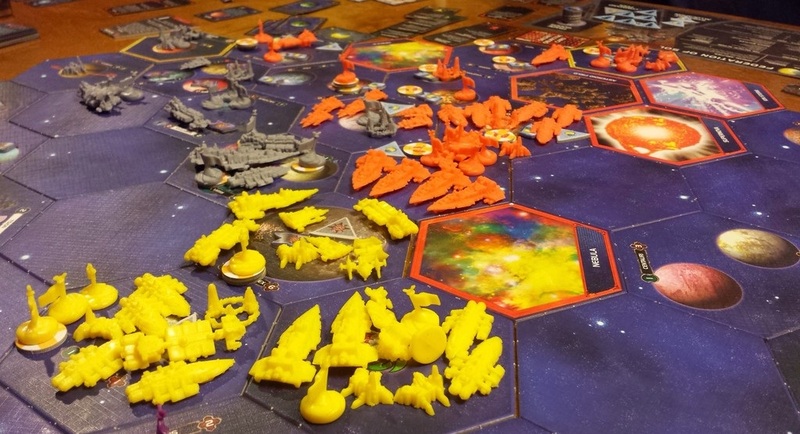 Much of the story of Rob can be seen by watching us playing Twilight Imperium, but some of the nuances of this are lost in the edit. There is a very particular thing that Rob does that makes him a sort of amoral Houdini. He combines misdirection with backstabbing. Let me put it another way: he stabs you in the back by making you look the other way. I understand now how Rob works. 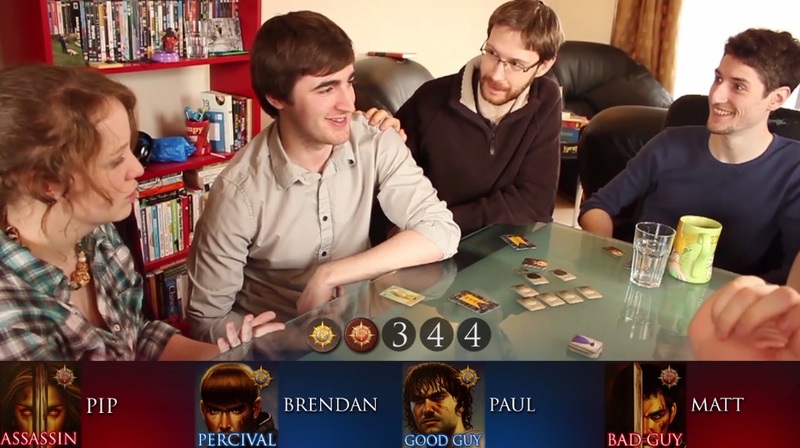 Rob, in just about any game, almost always ends up saying “Well, I’m hardly in a winning position, but look at Paul! He’s way ahead! 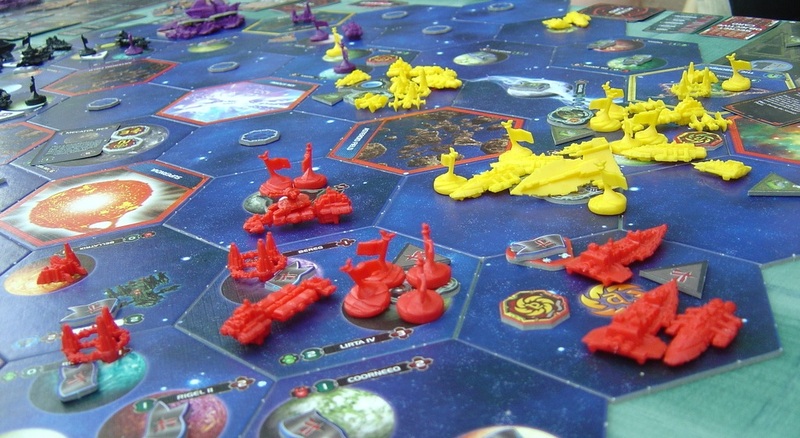 If we don’t do something about him…” He was doing this during Twilight Imperium. He’s done this in many other games. It’s often a prelude to his attacking you precisely because he’s set you up as a more powerful party who he, the tabletop equalizer, is going to sort out. You’re his stepladder. His stepladder to success. He does it so well, that innocent face of his, that disarming, distracting, duping expression. Then he turns on you, while everyone else is piling on you and while you’re weakened, protesting your innocence. Then he wins. Rob is always winning and always in the winning position. Rob got married last year. 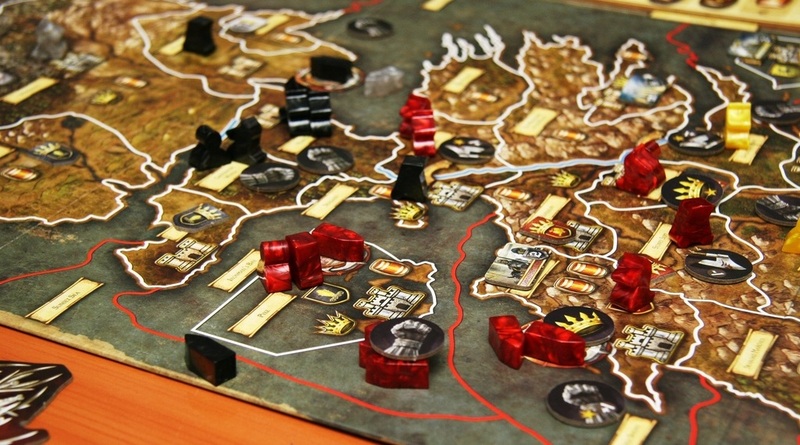 We played the Game of Thrones board game at his bachelor party and he tried to pull this again. About half the players weren’t having any of it, including me and his brother. We saw through what he was doing and we told him. We asked if his wife-to-be fell for this sort of thing (being a savvy astronomer and soldier, she naturally doesn’t). “She won’t play games with me any more because of this!” He cried. 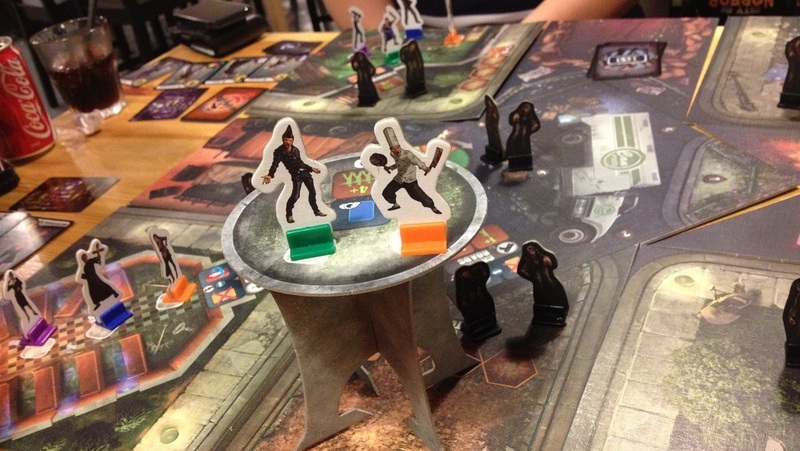 Matt: City of Horror brings out the worst in humans, and it was one of the first times I’d played games with Quinns. Possibly the first time, actually. I’ve no idea how we ended up as friends. As tends to be the case in City of Horror, things weren’t going terribly well. We’d evaded the eventuality of someone becoming zombie food by pulling out every trick we had. Exhausted, depleted, but with a helicopter inbound – we didn’t have long to wait until the nightmare was over. Luckily, I’d made a pact with Quinns. We’d had various deals going right through the game, but the last one was admittedly a little audacious – in exchange for saving the life of his most valuable characters in a building where the vote was more evenly split, he would sacrifice one of his weaker characters in the church, where he had the majority vote. When it came down to it I was amazed to discover that he’d decided to use his majority vote to instead save himself rather than throwing his own people out into the street. I couldn’t even be angry about it – I was a mug for believing him in the first place. Still, that did all happen in the same game in which another of my friends repeatedly threatened to blow up a building that contained a pregnant lady. In retrospect, it was an interesting day. The harshest betrayal I’ve been dealt by the fair hands of team SU&SD unexpectedly came from Paul, and to be perfectly fair wasn’t even really his fault. One of the nastier mechanics in Rex is the idea that some of your army generals might actually be working for somebody else. In practice, the idea is that these naughty defectors are something of a rarity – an unpleasant surprise that might catch you off-guard at an inopportune time. That wasn’t how things panned out this time, though. In my first (and only) two engagements of the game, I squared up against Paul only to discover that the general I’d sent in was working for him. These crushing defeats meant that he won within about 15 minutes, which still makes me glum as Rex seemed really cool and I never even really got a chance to play it. You could argue that this wasn’t a true betrayal by Paul, as it was simply a stroke of bad luck on my part – but the look on his face told a different story. I’ll never forget the creeping grin of evil glee that appeared on his face upon the realisation that he’d won by default not once, but twice in a row against the same opponent. And that opponent was me. Poor, poor me. In all seriousness though, these stories aren’t easy for me to muster – I’m usually the one spinning the web of horrid lies. And in the game lol etc. Obviously Brendan remains high on my kill-list for the time he abandoned me on an iceberg in Hey That’s My Fish. There will be blood, Mr. Caldwell. Brendan: It’s penguin eat penguin out there, loser. Paul: Reading back on all this, I realise now I am a terrible person.